The Bull at Great Totham01621 893385work01621 894029fax Restaurant with RoomsThe Bulls best kept secret, the delightful cottage set in the grounds has been tastefully renovated to provide four beautifully appointed double en-suite bedrooms. The rooms are individually decorated in a contemporary style with luxurious bedding and carefully chosen matching accessories. Each en-suite room offers a comfortable double bed, flat screen television with Sky and freeview channels, tea and coffee making facility and Wi-Fi. The Bulls best kept secret, the delightful cottage set in the grounds has been tastefully renovated to provide four beautifully appointed double en-suite bedrooms. The rooms are individually decorated in a contemporary style with luxurious bedding and carefully chosen matching accessories. 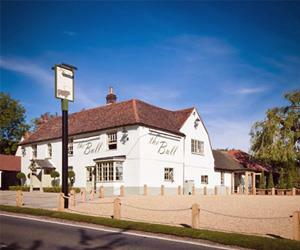 The Bull Gastro Pub and Willow Room Restaurant is situated near to the historical and popular Towns of Chelmsford, Colchester, Maldon and Tiptree, with their many tourist attractions and leisure activities.